Small businesses have created 61.8% of net new jobs in the US since the early 1990s. Local business is big business. Let’s celebrate this in honor of Small Business Saturday with 3 strategies that will support independent business owners this week, and in the better future that can be attained with the right efforts. It’s an annual shopping event sponsored by American Express on the Saturday following Thanksgiving with the primary goal of encouraging residents to patronize local merchants. The program was launched in 2010 in response to the Great Recession. By 2017, Small Business Saturday jumped to 7,200 Neighborhood Champions (individuals and groups that organize towns for the event), with 108 million reported participating consumers spending $12 billion across the country. Those numbers are impressive, and more than that, they hold the acorn of strategy for the spreading oak of a nation in which independently grown communities set standards of living, set policy, and set us on course for a sustainable future. This can be as simple as giving customers a small discount or a small free gift with their purchase, or as far-reaching as donating part of the proceeds of the day’s sales to a worthy local cause. Give customers a reason to feel extra good that they shopped with you, especially if you can demonstrate how their purchase supports their own community. Check out our Local Business Holiday Checklist for further tips. Creativity is your best asset in deciding how to make your place of business a top destination on Small Business Saturday, worthy of mentions in the local news. Live music? A treasure hunt? The best store window in town? Reach out to reporters if you’re doing something extra special to build up publicity. Turn a shopping moment into a teaching moment. Print up some flyers from the American Independent Business Alliance and pass them out to customers to teach them how local purchasing increases local wealth, health, and security. Take a minute or two to talk with customers who express interest. Sometimes, all it takes is a little education and kindness to shift habits. First, take a few minutes to boost your own education by reading How to Win Some Customer Back from Amazon this Holiday Season. AMIBA has a great list of tips for Small Business Saturday success and American Express has thebest examples of how whole communities have created memorable events surrounding these campaigns. I’ve seen everything from community breakfast kickoffs in Michigan, to jazz bands in Louisiana, to Santa Claus coming to town on a riverboat in California. Working closely with participating neighboring businesses can transform your town or city into a holiday wonderland on this special day, and if your community isn’t involved yet, research this year can prepare you to rally support for an application to next year’s program. Unless your town is truly so small that all residents are already aware of every business located there, make 2019 the year you put the Internet to work for you and your community. Even small town businesses have news and promotions they’d like to share on the web, and don’t forget the arrival of new neighbors and travelers who need to be guided to find you. In larger cities, every resident and visitor needs help navigating the local commercial scene. Dig deeply into the Buy Local movement by reading The Local SEO’s Guide to the Buy Local Phenomenon. Even if you see yourself as a merchant today, you can re-envision your role as a community advocate, improving the quality of life for your entire town. Expand your vision of excellent customer service to include the reality that your neighbors are almost all on the Internet part of every day looking for solutions to their problems. A combination of on-and-offline customer service is your key to becoming the problem-solver that wins lucrative, loyal patrons. Read What the Local Customer Service Ecosystem Looks Like in 2019. Not sure where to begin learning about local search marketing on the web? 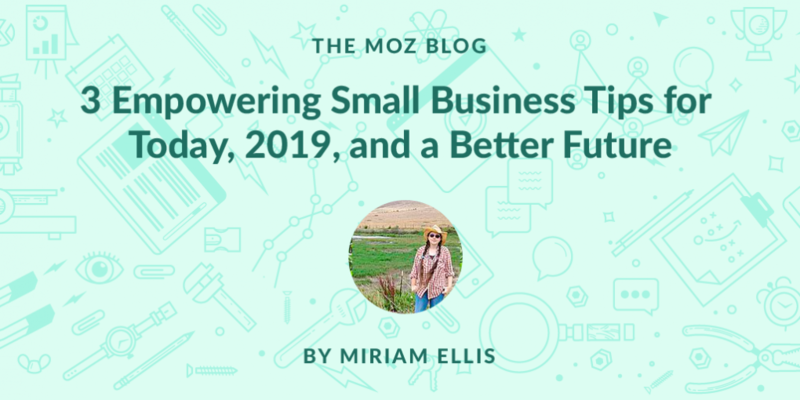 First, check out Moz’s free Local SEO Learning Center with articles written for the beginner to familiarize yourself with the basic concepts. Then, start following the recognized leaders in this form of marketingto keep pace with new developments and opportunities as they arise. Make a new year’s resolution to devote just 15 minutes a day, 5 days a week, to learning more about marketing your small local business. By the end of a single year, you will have become a serious force for promotion of your company and the community it serves. I’ve been working in local business marketing for about 15 years, watching not just the development of technologies, but the ebb and flow of brand and consumer habits and attitudes. What I’m observing with most interest as we close out the present year is a rising tide of localistic leanings. On the one hand, we have some of the largest brands (Google, Amazon, Facebook, etc.) losing the trust of the public in serious scandals surrounding privacy, human rights violations, and even war. On the other hand, we have small business owners uniting to revitalize their communities in wounded cities like Detroit and tiny towns like Bozeman, in the wake of the Great Recession, itself cited as a big brand product. Where your company does business may influence your customers’ take on economics, but overall, the engrossing trend I’m seeing is towards more trust in smaller, independently owned companies. In fact, communities across the US are starting to map out futures for themselves that are as self-sustaining as possible. 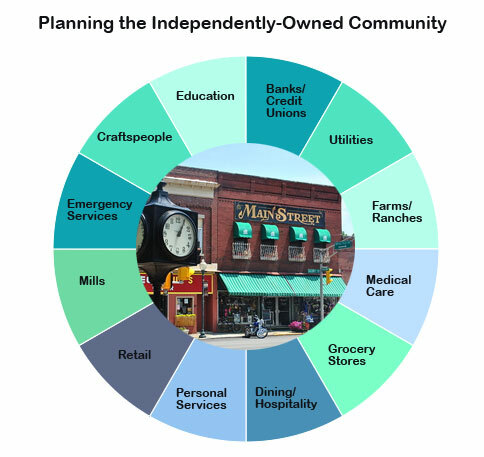 Earlier, I referenced small business owners undergoing a mental shift from lone merchant to community advocate, and here, I’ve mapped out a basic model for towns and cities to shift toward independence. What most communities can’t access locally are branded products: imported big label clothing, packaged foods, electronics, cars, branded cosmetics, books. Similarly, most communities don’t have direct local access to the manufacture or mining of plastics, metals, and gases. And, very often, towns and cities lack access to agroforestry for raw lumber, fuel, natural fibers and free food. So, let’s say for now that the typical community leaves these things up to big brands so that they can still buy computers, books and stainless steel cookware from major manufacturers. Even large cities can divest from big banks, putting their money into small banks and community credit unions. Communities can create their own solar energy, power themselves, and even sell their excess product to others. Internet, water, refuse, and recycling can be locally-owned, too. Whether in town or country, farms as small as 3 acres can feed 10,000 people in a year. Such farms can not only directly supply residents with fresh food, but can also stock independently-owned grocery stores and increasingly-popular farm-to-table restaurants. Communities are building or restoring mills to process grain and other products. Eventually, this could extend to fiber and lumber mills. Communities in some areas are already paying for the training and presence of their own doctors. And, part of city budgets are already often earmarked for fire and first responder services. With the right craftspeople, the necessities and luxuries of life can be produced by tailors, glass blowers, blacksmiths, potters, carpenters, masons, and others. Local or regional products can be vended directly or by independently-owned retailers. With some effort, residents can live in, sit on, wear, drink and eat from products made not far from home. Some cities are experimenting with free community colleges and others are opening local centers for continuing higher education like TechTown which helps local businesses launch and grow. Finally, there is the full menu of personal services like home services, elder care, beauty, and fitness that are already often independently owned and can continue to grow in a motivated community. There are certainly some things we may rely on big brands and federal resources for, but it isn’t Amazon or the IRS who give us a friendly wave as we take our morning hike through town, making us feel acknowledged as people and improving our sense of community. For that, we have to rely on our neighbor. And it’s becoming increasingly clear that it’s up to towns and cities to determine whether neighbors are experiencing a decent standard of living. Reading the mood of the economy, I am seeing more and more Americans becoming open to the messages that the percentage of small businesses in a community correlates with residents’ health, that quality social interactions lessen the chances of premature death by 50%, that independent businesses recirculate almost 4x as much community wealth, and that Main Street-style city planning massively reduces pollution vs. big box stores on the outskirts of town. Don’t be afraid to talk beyond transactions with your favorite customers. Listening closely, I believe you’ll discover that there’s a longing for change and that the time is right.